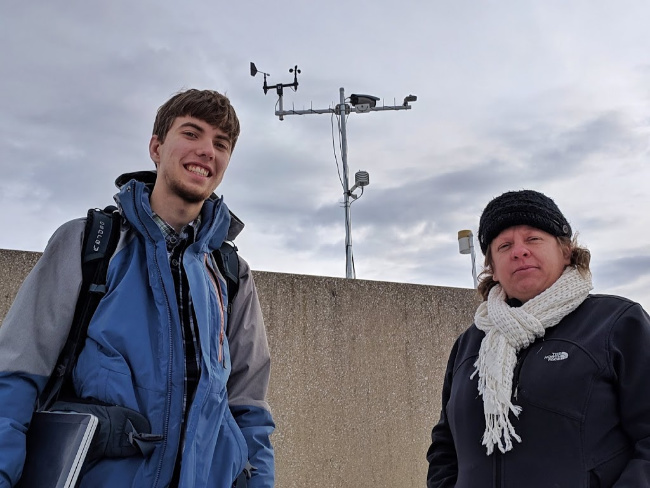 On a cold and blustery January morning, Shirley Papuga (right), an associate professor in Wayne State’s environmental science program, and environmental science student Alex Eklund (left) ascended the stairs to the roof of the Physics Building. Amidst the swirling snow showers and numbing cold, they checked on Wayne State’s first weather station. On this day, Weather@Wayne earned its keep. Weather@Wayne is part of the national Weather Underground network of weather stations located across the country. Many universities that offer environmental science and meteorology degrees are part of the network. Weather Underground provides weather data, forecasts and historical weather information. Weather@Wayne is funded jointly by the College of Liberal Arts and Sciences and the Office of the Vice President for Research. It transmits information automatically and requires no staffing. 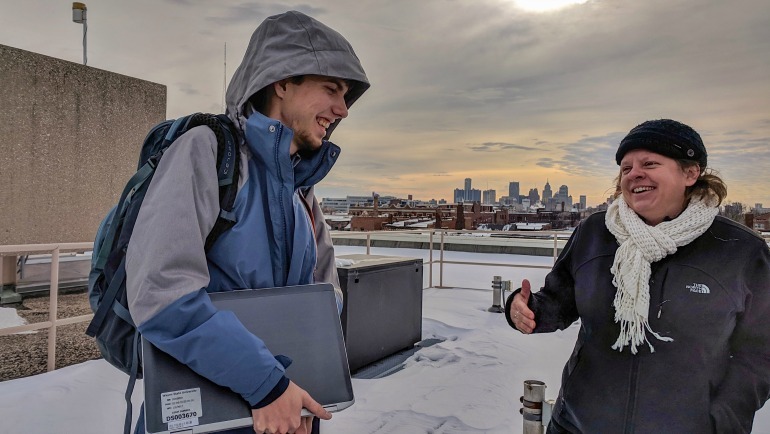 Shirley Papuga (right) and Alex Eklund (left) in front of the Weather@Wayne station — a wind vane, temperature and humidity probe, quantum radiation sensor and tipping bucket rain gauge installed on the roof of the Physics Building. The station was instrumented in summer 2018 by students in WSU’s Department of Geology and Environmental Sciences Program. A wind vane, temperature and humidity probe, quantum radiation sensor and tipping bucket rain gauge were installed on the roof of the Physics Building. The station offers half-hourly and daily streams of meteorological data such as rainfall, wind speed and direction, air temperature and humidity, and incoming solar radiation. The station also captures real-time images of the city skyline using a camera that monitors vegetation change in Detroit’s urban forest — providing a metric for carbon accounting consistent with WSU’s Sustainability Strategic Plan. With the Detroit skyline visible under a hazy gray patina of winter cumuli, Eklund and Papuga checked the equipment on the roof. Eklund said the occasional operational glitches are still being ironed out, but for the most part the weather station works well. “It’s reliable and self-sufficient and provides an important service to the city of Detroit and the campus community,” he said. Follow on Twitter @WeatheratWayne for daily recaps, daily forecasts and alerts.